Saritah delivers a potent combination of feminine spirit, conscious lyrics and heartful melodies whilst embodying a unique union of roots, reggae, soul, acoustic and dancehall. 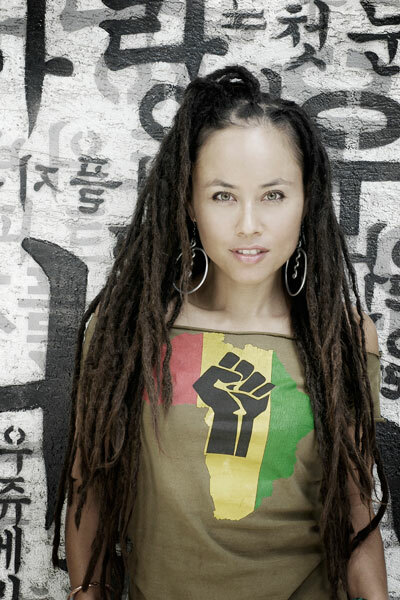 Conscious roots songstress Saritah (sa-REE-ta) is on a worldwide musical mission to uplift, inspire and heal. Bursting with an organic sound that is a refreshing and uniquely feminine weave of reggae, soul and acoustic inspired flavours, Saritah has a relentless passion for inspiring people to live their purpose and to follow their dreams. Playfully powerful, Saritah’s live shows are colourful celebrations of life. A festival favourite with her infectious, beaming smile, Saritah has graced the stages of some of the world’s most renowned musical gatherings. Born in Seoul, South Korea, the country of her mother’s heritage, Saritah grew up by the Indian Ocean in the most isolated city in the world – Perth, Australia. A traveller from the time she was a few months old, however, she has always had a global perspective and has been exposed to and influenced by a diversity of music and culture from around the world. Choosing a positive, earth-conscious, vegan lifestyle, Saritah is inspired both by the majesty of the planet we live on and the overwhelming realities that face us on a day-to-day basis. Vulnerably aware that this modern life can be overwhelming at best, her songs are celebrations, revelations, invocations, affirmations. Equally at home fronting a full band on the big stage with an audience of thousands as she is with an acoustic guitar in front of an intimate crowd, Saritah has a positive vision for the future that shines through every word she sings and every note she plays.